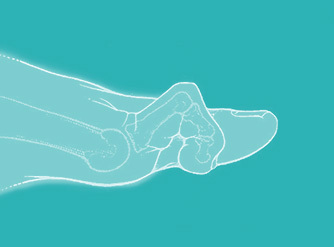 Hammer toe appears as hyperflexion of one or more toes of the foot at the intermediate interphalangeal joint. This anomalous flexion leads to the formation of a painful callous with dorsal bursitis, which may ulcerate on contact with footwear. This deformity can be either fixed or flexible and can arise in young people or as the consequence of a trauma. This condition is often associated with bunions. In this case, the hammer toe is hypertensive on the first phalange and flexed on the second. Hammer toe can be caused by arthrosis of the toes in individuals who suffer from cavus foot, traverse flatfoot of the forefoot, or who wear narrow, tight shoes and/or particularly rigid shoes. Physical therapy can bring great relief and the use of external supports (orthoses) helps to improve the position of the toe and to reduce the discomfort caused by shoes rubbing. Over time however, hammer toe may worsen and stiffen due to the retraction of the joint capsules and the doctor may diagnose the need for surgery. Recommended surgery involves the use of a mini-invasive percutaneous (keyhole) technique, as it does not use pins, metal wires or other fixation devices. It also encourages a quicker recovery.